-Scott: Monday afternoon will be fine at what time can you deliver it. I will wait for the delivery. From twelve to four? O.M.G. that's a four-hour wait. Can you be more precise? Unfortunately, I have to be at the office at some point. Could we do Wednesday instead? From 9 am to 1 pm. I fear I am never going to sleep on my new mattress. Lilly dear how are you? I need a favor. I will be grateful forever. I bought a new mattress and it seems they need a four hours window time of wait to deliver it. I can't be out of work for 5 hours. Could you wait here for it? Oh! you are amazing thanks so much for covering my home appointment. -Wait for delivery one: Lilly arrived at the apartment at 12:30 pm and waited for four and a half hours, actually five hours at Scott's place. The delivery company got there at 5 pm, in consequence, the building did not let the delivery company bring the mattress up, because management policies only allow deliveries from 9 am to 4 pm. -Scott: I told you it had to be before 4:00 pm. In other words, you can't arrive at 5 pm. Let's move forward, when can this home appointment be rescheduled? Can it be Friday at 9:00 am? Please, please be on time. Karen, Hi. Are you free Friday morning? Just to wait for delivery. Don't worry, I understand. Flora good morning, can you come and clean my place Friday morning? Okay, Monday at 9 am, perfect. Hi, can we reschedule for Monday morning? OMG, you are kidding me, only in the afternoon? When can you come in the morning? Wednesday? Okay, from 9:00 am to 1 pm. -Wait for delivery two: Flora arrives and starts cleaning. Scott calls at twelve thirty and asks if the mattress arrived. Flora says no, and I have to leave at one sharp. Scott calls the company and they say they are very close to the building. Flora receives a call from downstairs saying the mattress has arrived but that they don't have COI and workers compensation nor the elevator is reserved. They will have to reschedule. Flora calls Scott and Scotts feels so frustrated. -Scott: Why didn't you bring all the documents? Do I have to provide them to you? Do I have to reserve the elevator? Will do. When can we reschedule? Next Wednesday? Perfect from twelve to four. Please arrive before four. I will send you the forms and make sure the elevator is reserved. Hey, Management Company can I please have the forms so I can receive a new mattress? Thanks. Hey, it's me again, the attachment was not in the email! Got it thanks. Did you receive the email with the COI and other requirements? Please send the file to me. Thanks. Tuesday morning. Hey, I have not received the COI yet. Hey, Jonas can I reserve the elevator for tomorrow I am getting my new mattress. Yes, I will send the COI as soon as I receive it. I understand it has to be at your office today. Thanks. Did you send the COI? I have not received it. Here it is. The management office is closed. I can't believe it. Wednesday morning: did you get it? Yes, you are clear. Be advised that next time you have to reserve the elevator 3 days in advance. I had to pull some strings to make it happen. -Wait for delivery three: I asked for permission at work. It was not easy but got out of work. Had a light lunch and started to wait. At 3:45 pm they call from downstairs. My mattress was on its way up. Here, this is the master bedroom. Can you take the old one? It is not customary? What do you mean? It's 100$? Okay, I will pay you? If I have the bag? What bag? Regulation for bed bug protection? 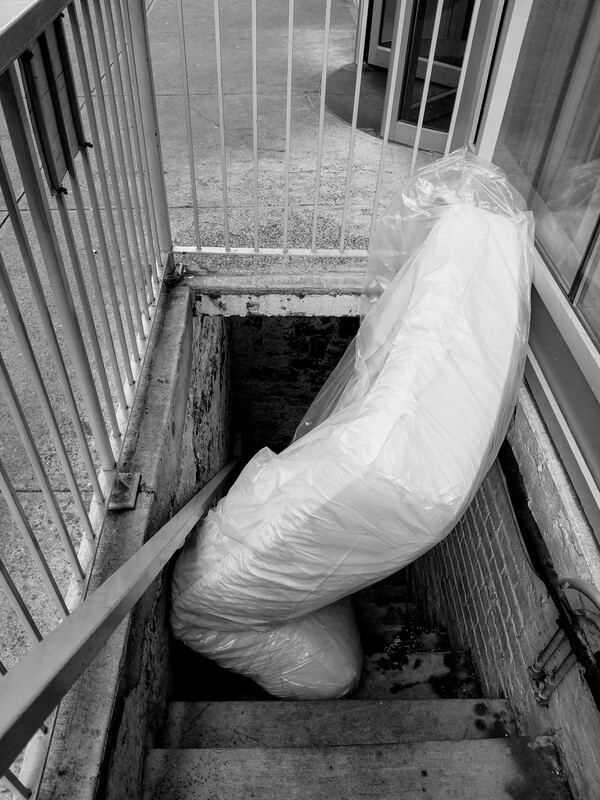 How can getting a mattress to be such a nightmare? NEXT TIME CALL THE PERFECT WIFE WE WILL WAIT FOR THE DELIVERY OF YOUR MATTRESS. PUT IT IN YOUR ROOM WITH NO HASSLE AND EVEN MAKE YOUR BED AND LEAVE A BOMBOM ON YOUR PILLOW. WE TAKE OVER YOUR HOME APPOINTMENTS.